Get Your Taste Buds Ready for the South Bay Festival of the Arts! Get your free tickets to the South Bay Festival of the Arts by clicking here! The 2nd Annual South Bay Festival of the Arts is gearing up to be a full day of foot-tapping live musical entertainment, hands-on creative workshops for the whole family, and delectable foods from eateries found only in the South Bay! The Food You Love to Eat! Arguably one of the best things about living in the South Bay (aside from the gorgeous weather and proximity to beaches) are all of the amazing restaurants and eateries you can only find here. The festival will showcase some of the South Bay’s favorites throughout the day, and they’ll be serving up tasty treats to satisfy even the most discerning palates! Food tickets will cost $3 each and are good for one tasting plate or a beverage (including beer or wine). The Brio Coastal Bar & Kitchen offers a fun, comfortable, and casual setting with fresh flavors and cool takes on favorite foods. From wood-grilled entrees and crafted handhelds to small plates and fresh salads, there’s something for everyone! For over 20 years Castle Rock Winery has been dedicated to creating delicious, handcrafted, high-quality wines – for affordable prices. By using some of the best appellations on the West Coast, Castle Rock Winery is proud to offer excellent wines at excellent prices. Chado Tea Room offers a tea tasting experience like nowhere else. With over 350 loose leaf teas to choose from, plus a delectable array of sandwiches, scones, and freshly baked desserts, there’s something for everyone to enjoy. Customized menus, fresh, tray passed appetizers, deluxe food stations, and decadent desserts are all hallmarks of Entertaining Friends Catering. What began as a family business making Hungarian strudel in Michigan came all the way to Southern California in 1977! After a death in the family caused them to close their doors for a while, Etta’s Strudel is back for a fresh start. They’ve become a beloved fixture at Farmer’s Markets and Hometown Fairs, and are bringing their delicate, flavorful strudel to the Festival! Since 4th of July of 2000, Falkner Winery has been wowing visitors with their award-winning wines and spectacular views of the Temecula Valley. With a passion for making salsa – and the purpose of doing good – Feel Good Salsa is on a mission to prove that business and philanthropy go hand in hand. Owner and chef Dina Feldman had a vision to create a company that not only made people feel good, but was also socially responsible, sustainable, and community driven. The “fresh” in Fresh Brothers Pizza is more than just a name. Everything they make is from fresh, all-natural ingredients (with no added preservatives) – from the cheese to the sauce to the crust, even down to the sausage! They even have plenty of vegan and gluten free options (including salad dressing). Ise-Shima offers exciting Japanese delicacies and the freshest sushi in the South Bay to visitors and and guests of the Miyako Hotel. King Harbor Brewing Company started out in 2014 with the goal of brewing beer packed with unique flavors. They’re proud to offer beers with exciting flavor profiles that have been inspired by life in the South Bay. Stop on by for a taste! A South Bay staple since 1979, Lisa’s offers fresh salads, sandwiches, and pastries to hungry lunch crowds. They originally began as a single location called Lisa’s Bon Appetit, but recently expanded to three upgraded locations around Southern California. All natural, fresh mediterranean food with a conscience is what you’ll find at Luna Grill. R.E.A.L. certified, GMO free, and 100% delicious, the made-to-order menu delights foodies of all ages! One of the latest restaurants to call Old Torrance home is Madre. With a menu packed full of authentic Oaxacan cuisine made from family recipes, Madre features an exciting selection of great food and fusion drinks. Dessert catering company Mini’s by Mara offers delectable (and adorable) desserts of all shapes and sizes. Mini French macarons, cupcakes, cookies, chocolate dipped pretzels, cake pops, and so much more. 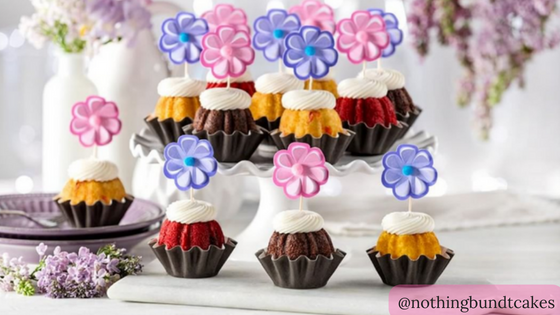 With ten luscious flavors of bundt cakes and over 40 unique cake designs, there is a flavor combination for everyone! Nothing Bundt Cakes takes pride in using real ingredients – and it shows in every mouth-watering bite. OneHope was founded by eight friends with a lofty vision: to create exceptional products that inspire people to indulge while also doing good for the world. They’ve partnered with nonprofit organizations all over the world to support causes that they, and their customers, care about. Plus, the wine ain’t bad either! What started in Hollywood as a hot dog cart over 70 years ago has become synonymous with the most delicious hot dogs in the country. Sample one of Pink’s famous chili dogs and find out why they’re considered a Hollywood legend. Red Car Brewery, the first brewery in Torrance, is a staple of the community. Since opening in 2000, RCB has provided locals with a warm, welcoming place to enjoy delicious food, signature ales, and the company of friends. Delicious. Unique. Sweet. Savory. All these words can be used to describe the treats from Tamiza’s Treats. Offering a variety of small cakes, cookies, fudge, biscotti, breads, popcorns, and more, there’s something for everyone! Zymurgy Brew Works is a nano-brewery that specializes in making high-quality beer in small batches. They also offer do-it-yourself brewing options at the brewery for new and experienced brewers who have a hankering to craft their own beer. To buy food and drink tickets, go to the main ticket sale booth located at the Cultural Arts Center. Tickets are $3 each and will be good for one food or beverage item. Want to skip the lines? Have access to private bathrooms and an air-conditioned, food-filled VIP lounge? Then get your VIP ticket today and enjoy exclusive access and extras available to VIPs only! Get your VIP tickets by clicking here! 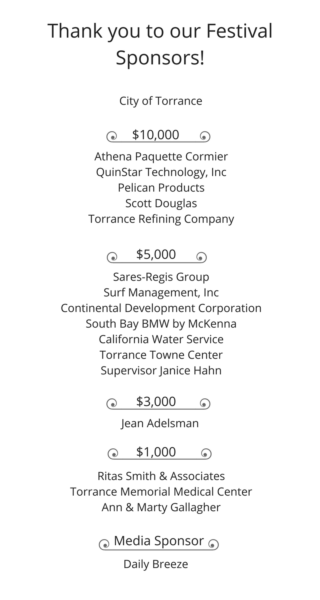 RSVP for the South Bay Festival of the Arts Today! The South Bay Festival of the Arts is FREE for everyone to attend! It’s an all-day event featuring fine foods, craft beer, local artisans, and top-notch performers. Register today to let us know you’re coming!